Yes friends, I've been remiss in reviewing! At the same time, I want to move upward and onward to bigger things (and yes, that includes starting to expand my sphere once more beyond comics! ), so herewith is a whole mess of reviews of recent comics, dubbed my "ASAP Reviews"! They're not ASAP because of their timing--cruel joke, that--rather, they'll go against my usual verbosity by being As Short As Possible. Same rules as my previous "Quick Reviews" apply, as on top of a sentence or three about each book, you'll know whether I recommend you Buy It, Read It, Skip It or Burn It. 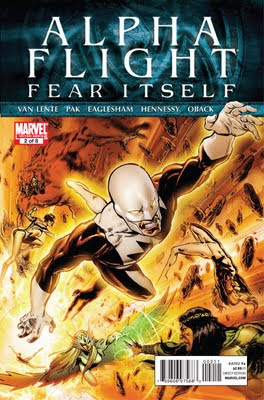 ALPHA FLIGHT #2 (By Greg Pak, Fred Van Lente, Dale Eaglesham, Andrew Hennessy & Sonia Oback) - Pak & Van Lente's super saga continues, with Fear Itself only a tertiary part of the story being told. Still solid art by Eaglesham & co., and the story comes into clearer focus with further developments involving the "Unity" party and historical elements involving all characters that may leave newbies lost. More familiar faces pop up in interesting ways, but overall, this one's of more interest to longtime Flight fans. Read It. 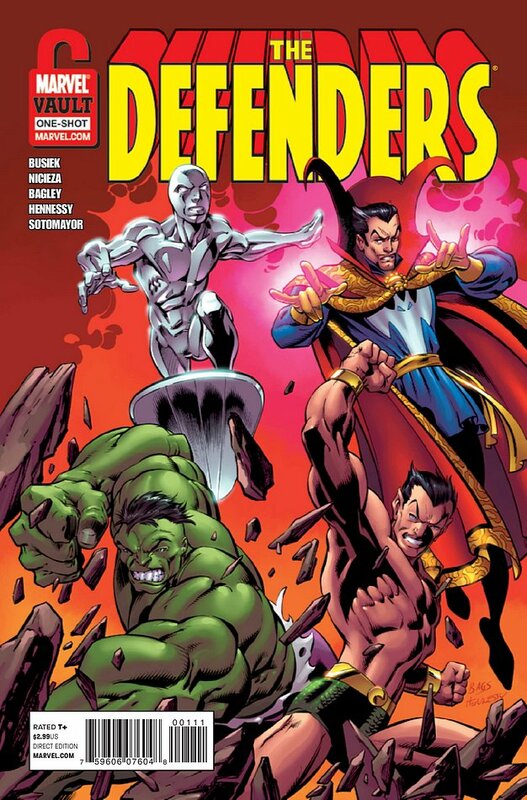 DEFENDERS: FROM THE MARVEL VAULT #1 (By Kurt Busiek, Fabian Nicieza, Mark Bagley, Andrew Hennessy & Chris Sotomayor) - With a storyline that just might rival the original 2001 Busiek/Larsen Defenders series for sheer, unbridled lunacy, this one-shot is just what the doctors (Banner & Strange) ordered. 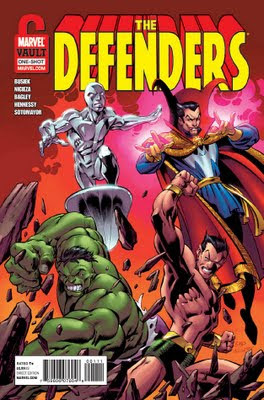 I'm a sucker for tales of the original four Defenders, and well, this is certainly one of those. With a plot that likely has nothing to do with its goofy script, file this one under "must be read to be believed." Even if it doesn't deserve a buy, the least you can do is Read It. GHOST RIDER #1 (By Rob Williams, Matthew Clark, Sean Parsons & Rob Schwager) - Oh, look! It's another series where the protagonist is radically changed, his powers given to another, leaving said protagonist on a trek to regain his powers, or something like that. Matthew Clark's art is ssssssmokin', but I still can't get past the premise. Although not with this character, it's been done to death. 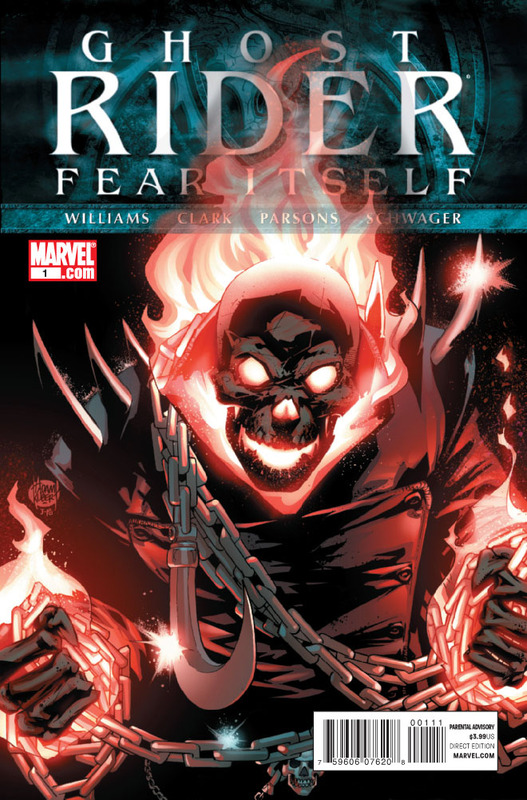 Unusual that Zarathos is shown among the gallery of baddies at the beginning if Ghost Rider's supposed to be he, and incredible that nobody in editorial caught the snafu of including the wrong Lilith among the rogues on the same spread. Not giving up altogether, but for now I'll be nice and say just Skip It. HULK #37 (By Jeff Parker, Elena Casagrande & Bettie Breitweiser) - Fear Itself has struck the Red Hulk's book at long last, and surprise surprise, it's not as intrusive to the overall storyline as one would have imagined. M.O.D.O.K., Zero/One and Black Fog join Tron Thing, I mean Angrir, Breaker of Souls in tormenting the red rampager. 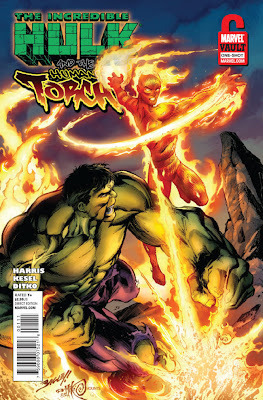 It would seem we already know the ending of the story from last month's Avengers #14, but who really knows? Casagrande's art is an unobtrusive change from Hardman's, and Parker's script is capable enough for the package to make me recommend you Read It. "Identity Wars" in AMAZING SPIDER-MAN ANNUAL #38, DEADPOOL ANNUAL #1 & INCREDIBLE HULKS ANNUAL #1 (By John Layman, Lee Garbett, Juan Doe, Al Barrionuevo & more) - Chew's very own John Layman embarks three of Marvel's most popular characters on an adventure into an unusual alternate reality, with suitably disastrous consequences for all concerned. 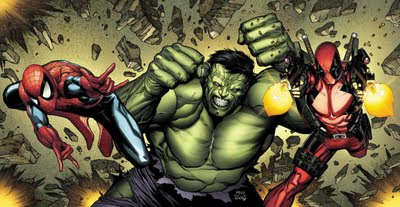 Delightfully Silver-Agey in feel, the storyline opens strong with the Spidey chapter, softens in the middle with Deadpool (whom I've never really enjoyed anyway), and finishes with some interesting variations on the Hulk. So I'm a sucker for a horny Hulk. (And that is SO not to be taken the way you think!) 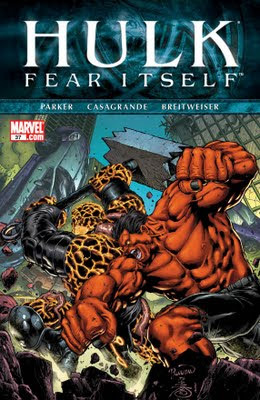 Just plain fun, but Deadpool prevents me from having you do more than Read It. THE INCREDIBLE HULK & THE HUMAN TORCH: FROM THE MARVEL VAULT #1 (By Jack C. Harris, Karl Kesel & Steve Ditko) - None of these one-shots featuring old inventory stories has been more fun than this one, and it's almost exclusively due to two words: Steve Ditko. Kesel scripts adequately from Harris' original plot in a tale that teams the heroes against the Wingless Wizard. Ditko's art is a joy to behold and Kesel's inks are delicious. Kesel needs to remember that the Hulk has no problem conjugating verbs, but really, that's a small quibble. Everyone should rush out and Buy It already! More later in the week, with reviews of Ed Brubaker & Steve McNiven's brand new Captain America #1 and Greg Pak & Mirco Colak's Red Skull: Incarnate #1 accompanying a review of Marvel Studios' newest summer blockbuster, Captain America: The First Avenger!